2018-2019 Biography | Benjamin Hochman | Kirshbaum Associates Inc.
A dedicated advocate for contemporary music, he has worked closely with composers Krzysztof Penderecki, Brett Dean, Philippe Hurel, Joan Tower, William Bolcom, Yehudy Wyner, Tamar Muskal, David Ludwig and Menachem Wiesenberg, among others. Benjamin Hochman has been selected to participate in prestigious residencies around the world such as The Bowers Program (formerly CMS Two) at the Chamber Music Society of Lincoln Center, Isaac Stern's International Chamber Music Encounters in Israel and Carnegie Hall's Professional Training Workshops with Osvaldo Golijov and Dawn Upshaw, as well as Boston Chamber Music Society. 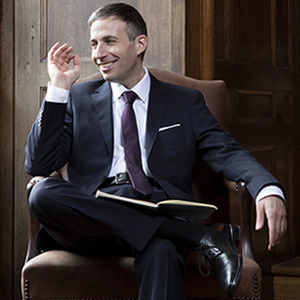 Mr. Hochman received the "Outstanding Pianist" citation at the Verbier Academy, the Festorazzi Award from the Curtis Institute of Music, second prize at the Melbourne International Chamber Music Competition, the "Partosh Prize" awarded by the Israeli Minister of Culture for best performance of an Israeli work and first prize at the National Piano Competition of the Rubin Academy of Music in Jerusalem. His performances have been broadcast on National Public Radio's Young Artist Showcase and Performance Today, WNET’s Sunday Arts, WQXR, CBC (Canada), ABC (Australia), Radio France and Israel's Voice of Music radio station, as well as on the European television network Mezzo.